Weekly Diving Blue Cruises, Mehmet the experienced sponge diver shows you the underwater world for scuba divers. 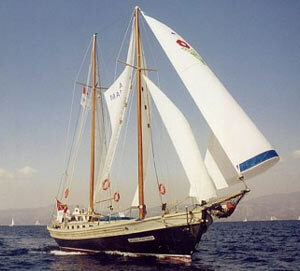 M/S AKSONA, the sponge diving boat was built by one of the great masters of boat-building "Ziya Usta" in Bodrum. It is a "Tirhandil" (double-ender) with the length of 18,5 m and the width of 6 m.
M/S AKSONA and her Captain Mehmet Bas together present you with a "Blue Voyage" along Turkey's Aegean and Mediterranean shores for periods of your own choice. A private "Blue Voyage" for your own group for up to eight passengers. The cruise route, and the bays, villages and townships, and archaeological ruins to be visited will be determined according to your preference. Each detail will be discussed with your wishes as to present you with a vacation bespoke for you and your group. If you wish, M/S AKSONA, formerly a classical fishing vessel of "Tirhandil" design, will stop her engines and with her sails fully stretched by wind, will silently cruise as you to listen to the sea. You will be able to change the cruise schedule at will and drop anchor wherever you please for as long as you wish. All services will be served on board by the crew. Victuals and menus will be provided according to your wishes. To share Aksona Mehmet's sponge diving and seamanship accretion of more than 35 years with a "Blue Voyage" will truly be an unforgettable experience. It will be possible to witness with your own eyes, together with Aksona Mehmet, the immense difference between the surface and the depths of the sea, and discover the mysteries, the excitement, the magnificence of the deep sea. As a parting remark, Aksona Mehmet has this to say: "Anyone who embarks my boat, no matter from which part of the world, deserves the best of everything". Fullboard (3 meals + teatime) price &euro; 28,- p/person per day . If there are vegetarians among your group, no problem at all, the Turkish cuisine with its rich choice of fresh vegetables is the best solution for that, you just tell us. Soft Drinks and alcoholic drinks are extra, we can buy them and you just pay us the bill plus a service-extra for the crew of only 15%: We think that's a fair offer and all previous guest did very much appreciate that. Itinerary: You may start your journey either in Bodrum, Marmaris or Gocek, we can plan and arrange it with you, depending where you wish to go (see the map here) or according to your chosen airport, Bodrum or Dalaman. sorry to say, but flights we do not arrange. VHF, CD/stereo music system. Fully equipped galley, saloon, sun mattresses, dinghy with outboard motor.